What happens when the LGBT community collides with the Muslim community in the UK? We get protests, accusations of homophobia, retorts of just wanting to maintain traditional religious values, both sides feeling like the “victims,” and, in the end, a series of LGBT rights and equality classes cancelled at schools in Birmingham’s Parkfield Community School district. It’s like a leftist circular firing squad, where each group tries to out-victim the other. Whoever is more “oppressed” wins! The Muslim schools did not want the LGBT lessons. 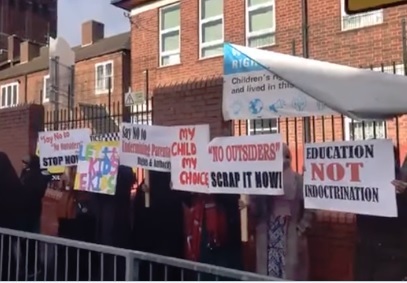 But outraged mum Fatima Shah, who has taken her 10-year-old daughter out of the school, told BirminghamLive : “It’s inappropriate, totally wrong. Four more schools have joined in and will no longer carry the LGBT content. The program was meant to combat homophobia. The Muslim parents don’t care. Yes, apparently this program is “age appropriate” for infant and primary school students. Someone, somewhere, is bound to blame Trump for this. Previous Previous post: How Does a Far Left Anti-Trump Obama and Hillary Deep State Donor Get Nominated to Ambassadorship in a Trump Administration?